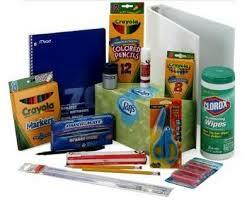 For your convenience, Park Campus PTO is selling pre-packaged school supplies for the 2015-2016 school year. We do the shopping and you enjoy your summer! We will have them ready for you to pick-up before school starts in August. Please order online or return the order form below with your payment to the main office no later than Thursday, June 25, 2015. Please Note: Supply packs do not include the following: backpacks, calculators, dictionaries, gym shoes, book covers, socks (for use as a white board eraser), optional supplies, or items that may be added after June 25.